catch a break as coaches? Jody Runge stands over the sink, scrubbing dishes. The kitchen counters are cluttered with the remnants of breakfast: a pancake skillet, a cutting board, coffee mugs. Her guests have excused themselves from the main house, returning to their rooms in the cottage around back. During the meal, they all chatted happily, and Runge bubbled with curiosity, filling any silence with questions. "Every morning it's a new story," she hums, satisfied, as she loads the dishwasher. "I just enjoy that so much." Jody Runge resigned under pressure 11 years ago. But her former Oregon players, some of them now coaches themselves, continue to stand in her corner. On this rainy March morning, though, the guests don't ask about Runge's own story, don't ask what twists and turns led her to A Painted Lady Inn, this bed-and-breakfast in Portland's charming Northeast neighborhood. So they don't know that the soft-spoken proprietor of the warm Victorian, the striking 6-foot-2 blonde who changes their sheets and scrambles their eggs, used to be one of the top women's basketball coaches in the country. That's how Runge wants it. Maybe even how she needs it. In quarters right out of a Bronte novel, Runge has allowed herself only one nod to her former life: a front-page newspaper story, framed in sharp metal, sits atop an antique wood cabinet. In the accompanying photo, Runge waves to the crowd at Oregon's old McArthur Court during a ceremony in 2010. Nine years after her departure as coach, she is being feted as the evening's "honorary captain" as part of the school's farewell to the arena. In each of her eight seasons, Runge led the Ducks to the NCAA tournament. She won two Pac-10 titles and 70 percent of her games. She also fought for equality, demanding better practice times, fair distribution of gear, respect for her players and pay commensurate with that of her peers. She rocked the boat. And for her trouble, she says the administration tipped her overboard. Which explains why in the photo of the waving Runge, her lips smile, but her eyes do not. 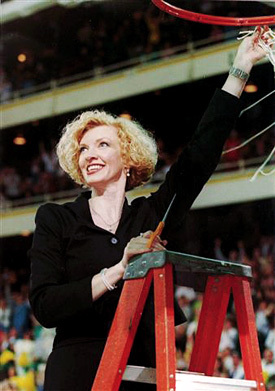 Runge bought her home the same year she resigned, after a tumultuous final season with the Ducks. She was 38 at the time, and figured she would take a year off to let the dust settle, to catch her breath, before getting back in the game. After all, she'd built Oregon into one of the Pac-10's elite programs from little more than a bag of basketballs and a vision of greatness. In the three seasons before her arrival, the Ducks had gone 15-39 in the conference and averaged 670 fans a game. Attendance jumped to almost 2,400 in her first season and soared to nearly 6,000 a few years later. Surely the game would welcome back such an accomplished coach. ESPN analysts Carolyn Peck and Kara Lawson discuss the issues around hiring female coaches. But a one-year break turned into five; five turned into a decade. Runge phoned athletic departments that posted openings. She faxed her resume and stockpiled recommendations from former players, even those whose comments contributed to her resignation. In the 11 years since she left, she has applied for more than 20 jobs. Exactly one school returned her call -- a Pac-10 program that arranged a furtive interview, seemingly loath to reveal her as a candidate. It's the silence, not the rejection, that's most telling. "When I walked away, I knew how hard it was for women to get another chance," Runge says. "I knew how women's basketball worked. But I kept thinking my record was strong enough, that I'd done so well that somebody would want me." of Title IX. Female coaches, no matter their record, often find themselves on the outside looking in. And who's on the inside? Over the past four decades, the number of female college athletes has soared, but the percentage of female coaches has plummeted. In 1972, when Title IX was passed, women coached more than 90 percent of women's teams. By 1978, that number had already dipped to 58.2 percent. This year, it's down to 42.9 percent, according to the most recent survey by Brooklyn College professors emerita R. Vivian Acosta and Linda Jean Carpenter. That figure has hardly budged over the past six years. Schools looking to woo -- and support -- top female coaches just need to follow the blueprint Maryland has used with Brenda Frese. But while some experts may consider this holding pattern a victory, the raw numbers say otherwise. Since 2000, NCAA programs have added 1,774 women's head coaching jobs. Men have filled 1,220 of the openings. Women have entered the rest of the workforce at all levels and now make up 57 percent of college students. Sports are bigger than ever for them too, with an average of 8.73 women's teams per school. And yet female coaches continue to be sidelined. Stanford women's basketball coach Tara VanDerveer is only half-joking when she says, "We'll have a female president -- and one woman coaching women's college basketball." It's not as if women are finding new opportunity in the men's game: Only about 3 percent of men's teams are coached by women, the same percentage as before Title IX's passage. Coaching is a man's world. Back in the 1970s, few men wanted to coach women. When Pat Summitt began her career at Tennessee in 1974, she made $250 a month, washed the squad's uniforms, drove the team van and sometimes slept alongside her players on the opponent's gym floor the night before a road game. But within 10 years of Title IX becoming law, women's sports had erupted, claiming 16 percent of athletic budgets where once they received just 1 percent. Coaches of women's teams could earn a living, even prestige. And before long, men began to gobble up most of the job vacancies. Some blame the dropoff on a shallow pool of female candidates, who often aren't as eager to apply for jobs, let alone pack up and move, as men. But there are more pernicious reasons as well. First is an old-fashioned sexism that gives men a chance to coach women's programs but squelches any thought of hiring a woman to coach men. There is also an ingrained homophobia that quietly pressures women to hire male assistants so as to combat any appearance of a "gay" program. One other theme came up again and again during espnW's dozens of interviews: a lack of second chances for female coaches. Male coaches, particularly in men's sports, often pass through a revolving door whenever they lose a job -- from Bob Knight to Rick Neuheisel to Rich Rodriguez. But women fear they are much more likely to be one and done. Runge's story may sound extreme. It's not. Across all sports and teams of both genders, women hold 20 percent of the top jobs -- and that actually puts basketball ahead of the game. On every Division I campus, there are approximately eight basketball coaching positions: four on the men's side, four on the women's. Men can and do apply when any of those become available; inevitably they fill six of them. Women, however, will vie for only four slots -- the women's team slots -- and claim two. That men can coach women while women are shut out of the men's game is a phenomenon researchers call "The Glass Wall." Women can see the thousands of jobs on the other side. They just can't get to them. Jody Runge led Oregon to two Pac-10 titles, but she says she has received only one coaching interview in the 11 years since she left Eugene. Female head coaches often contribute to the disparity by hiring men as assistants, and not only to placate recruits' parents with a male (read: straight) presence. Some women believe they need a man's voice on the bench. That thinking doesn't cut both ways. "If having a man's voice in the room is important for women, why aren't women's voices in the room in men's basketball or football?" asks VanDerveer, the Hall of Fame coach. "People will say whatever to rationalize any situation." A situation that effectively makes 50 percent of all college coaching jobs off limits to women. Nefertiti Walker, an assistant professor at UMass Amherst and a former Division I basketball player, has studied the glass wall. She asked men's head basketball coaches if they would hire a woman, and the majority were quick to name Summitt. In other words, the one female qualified to shatter the wall is the NCAA's all-time winningest coach. When Walker pointed that out to her respondents, they explained that "breaking the institutional norm" required an exceptional candidate. Although the Acosta/Carpenter study notes that 2 percent to 3.5 percent of men's teams are coached by women, that number is inflated by individual sports like track and field, and swimming and diving. Of the NCAA's team sports, researchers estimate the number of women coaching men is below .05 percent, with none in Division I. Applying for a men's coaching vacancy is an exercise in futility for women, and apparently they know it. Of the dozen or so administrators interviewed for this story, none had seen a female candidate for a men's coaching job. Nicole LaVoi, associate director of the Tucker Center for Research on Girls & Women in Sports, believes the NCAA's job postings for men's coaching openings should include language that encourages female applicants. She dreams of a marketing campaign that says, "Hey, women coaches, don't just apply for women's jobs. Apply for men's jobs. It's what the men do." The lack of women in the men's game is more than just a fair-employment issue for the coaches. It is also an equal opportunity issue for the athletes. While female student-athletes are usually exposed to both male and female mentors, men almost never are. "I think, in general, athletic departments lag behind the rest of the campus on all kinds of equity issues," says Ceal Barry, associate athletic director at the University of Colorado. Barry is also CU's senior woman administrator, an NCAA-mandated label, created with the hope of preserving female voices in athletic departments. According to a UMass Amherst study released in February of this year, the percentage of women coaching men has remained minuscule in the Title IX era, while the number of men coaching women has risen dramatically. Karen Morrison, director of gender inclusion for the NCAA, thinks a bias exists in which men continue to be perceived as more viable candidates. "That's a personal opinion, not the NCAA's opinion," Morrison says, before adding: "We do not tell our schools whom to hire and how to hire, but we certainly want to impress upon them why having female role models as administrators and coaches is important to the development of both women and men as student-athletes and citizens." Even as society in general becomes more accepting of women in leadership roles, female coaches in the NCAA can't seem to crack the glass wall. Instead, in one sport after another, they continue to lose ground in their own game as male coaches move first into assistant coaching positions and then, gradually, into the top jobs. Since the inception of Title IX, basketball has been the NCAA's marquee women's sport. The money poured in early, the pressure increased dramatically, and by the early 1990s most female head coaches were hiring male assistants. Many of those men became the game's next head coaches (UConn's Geno Auriemma the most notable among them). Now, the arc of hiring male assistants who go on to become head coaches is playing out in other sports. Division I softball, about a decade behind women's basketball in terms of growth and exposure, has seen the percent of female coaches drop from 74.8 in 2000 to 60 this year. "My concern isn't necessarily what softball looks like in three years, but what it looks like in 30," says Sue Enquist, former softball coach at powerhouse UCLA. "We need to get organized -- now." A four-point plan to help women earn more coaching opportunities. A similar trend is playing out in field hockey. While the sport is still dominated by female head coaches, those women are increasingly hiring male assistants, often from abroad. 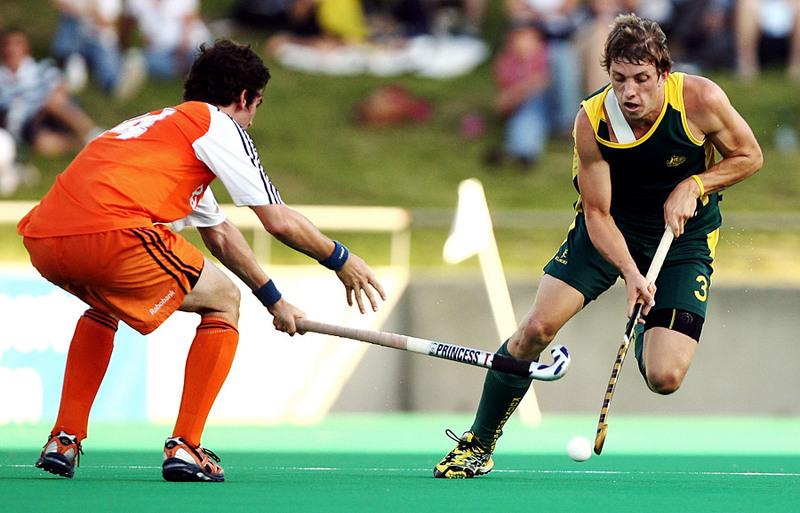 Countries such as the Netherlands and New Zealand, where the game is played by men in high-level club leagues, supply more and more U.S. college coaches. There is a "keeping up with the Joneses" element to this hiring practice, says Peel Hawthorne, head coach of William & Mary's field hockey team. Coaches want what the neighboring staff has -- an international, male perspective. "But I don't know if that little voice in their head is saying, 'This is bringing in the next generation of coaches,'" Hawthorne says. "It's like anything else: Once the ball gets rolling, the results are exponential." Since 2000, the percent of female coaches in Division I field hockey has dropped from 98 to 87. "I don't think we really see men as a threat ... yet," Hawthorne says. "But I think that's just a lack of awareness, really. The basketball model is a little ominous." The worst part is, the problem is self-sustaining. For starters, fewer female coaches means fewer coaching role models for female athletes. Lavoi's research shows that if young female athletes don't see women in positions of power -- as either head coaches or top administrators -- they will be less likely to consider a similar career path. "If you don't have women doing it," Michigan softball coach Carol Hutchins says, "young women can't dream it." The generation of current basketball coaches now bearing down on retirement grew up when women actually dominated the ranks. Pat Summitt became, well, Pat Summitt partly because she played for the legendary Billie Moore on the 1976 U.S. Olympic team. But there's significantly less torch-passing these days. "I always ask our players, 'Why don't you think about becoming a coach?'" says Florida women's soccer coach Becky Burleigh. "Some of them haven't even thought about it until I mention it." An increasing number of young women reach NCAA teams without ever having played for a woman. Youth sports are overwhelmingly coached by men, especially the higher-profile club and travel teams that produce most college prospects in sports like basketball, softball and soccer. Girls grow used to that particular division of labor. "The dads coach, the moms drive," Hutchins says. "And the girls become trained that men are the people with the knowledge, the voice of authority in the leadership position." Change has to start at the top, and according to a study by Brooklyn College professors emerita R. Vivian Acosta and Linda Jean Carpenter, female ADs are still a rarity. U.S. Olympic hopeful Morgan Uceny, the world's No. 1-ranked runner in the 1,500 meters, competed in one of the few college sports in which women sometimes coach men. So how many women have coached her? "Zero," says the Cornell alum. "I've never had a woman coach, in any sport. Now that I think about it, that's surprising." An absence of role models not only keeps girls from growing up to become coaches, but it also creates obstacles for those want to try. Boys and girls accustomed to male coaches become recruits who don't want female coaches. "When I talk to kids, they are candid," says Mary DiStanislao, the senior associate director of athletics at Penn. "They say, 'I've only had male coaches; I'm more comfortable with a male coach.'" It's one reason female head coaches feel pressure to hire male assistants. But it's not the only one. Many women, quite frankly, haven't helped each other out. Female coaches cite a lack of mentoring within their ranks. Ensconced coaches often feel paranoid about their own job security, so they spend little time preparing the next generation. "It's the difference between women being willing to help, and women having a sense of urgency to help," Enquist says. "We need to get the best ones out in front, and I don't know if we're doing that." A few years ago, Penn State basketball coach Coquese Washington reached out to VanDerveer, who promptly invited Washington and an assistant to her offseason home in New York. The group spent hours discussing the X's and O's of the famed Triangle offense. "I'm accessible to anyone," VanDerveer says. "I'll help anyone who asks." She is just trying to do what has been done for decades in the men's game. Established coaches mingled with fresh-from-college players and high school coaches at gatherings like the old Five-Star camps. Old and young exchanged knowledge and business cards (or phone numbers on bar napkins), and the connections often led to regular mentoring or even jobs. But an encounter like the one between VanDerveer and Washington is a rarity in women's basketball. VanDerveer is one of a small roster of women's basketball coaches -- Summitt, Texas' Jody Conradt, Texas Tech's Marsha Sharp -- who served for decades as the faces of their sport and were committed to growing it. While there is a group of outstanding 40-something female Division I coaches today, among them Baylor's Kim Mulkey, Oklahoma's Sherri Coale and Maryland's Brenda Frese, older coaches fear there is no comparable "next generation" to lead the way. And that leaves the door wide open for men. Athletic directors who spoke with espnW for this story say they consistently receive significantly more applications from men for all coaching vacancies. "There isn't a job that's not dominated by male applicants," says DiStanislao. Michigan's Hutchins tells the story of one former player who was in the running for an assistant gig at a big-time softball program. The player was a perennial All-American who led her team to three College World Series. A shoo-in for the job, right? "The school hired the male manager from another program," Hutchins says, still oozing bewilderment. Even field hockey, long the domain of female coaches, has seen a demographic shift, with colleges importing male players from abroad to serve as assistants. Women's teams have hired male assistants whose only qualification is having served as a manager or practice player. The male practice team at Tennessee has launched a few coaching careers, as have those at Colorado and USA Basketball. These men are chosen at the expense of women who have actually played the game at the college level. Once again, the reverse is never true: Managing a women's college team qualifies no one for entry into the men's coaching ranks. "Too many athletic directors say, 'We have to get the best candidate, and the female pool is so weak,'" Hutchins says. "That just makes me cringe." Plenty of male ADs, of course, like Maryland's Kevin Anderson, say they understand the importance of expanding the applicant pool. Maryland, with its flagship women's hoops program and a department that was run for years by Debbie Yow (now at North Carolina State), is known as a welcoming place to apply. "We are a great school academically, a great school athletically and a great place to live," Anderson says. "There's a lot to sell. But Debbie created an environment that's conducive to getting women to come here to work." The male coaches espnW spoke with -- including North Carolina women's soccer coach Anson Dorrance, Texas A&M women's basketball coach Gary Blair and Penn State women's volleyball coach Russ Rose -- stressed the necessity of keeping women on the bench. "I always like having a female on my staff," Rose says. "Right now, the people actually pursuing the jobs are men, but my belief is you should have balance." And yet even the most progressive institutions say they're overwhelmed with male applicants for every job opening. Bowling Green hired Danijela Tomic from Florida International as its women's volleyball coach in December, but only after having to persuade her to apply. Lesley Irvine, Bowling Green's assistant AD, says that of the 100 or so applicants for the job, 65 to 70 were male. Judy Sweet, a former NCAA senior vice president and longtime AD at UC San Diego, co-founded the Alliance of Women Coaches in 2011 to help remedy the inequity. "At one point years ago, I'd have said the biggest cause of the lack of women coaches is the decision-makers who aren't selecting qualified women," Sweet says. "But now, for a lot of reasons, a lot of women just aren't applying for jobs." Some of them may just need a seminar in the finer arts of BS. Colleen Hacker, a professor at Pacific Lutheran and a team psychologist for the U.S. women's soccer team, cites a study from the 1980s that found female candidates believed they needed to meet nine of 10 requirements on a job posting to even apply. "For men, it was five out of 10," Hacker says, noting that subsequent studies have verified this phenomenon. So women need a dose of chutzpah? "Exactly," Sweet says. In addition, anecdotal data suggest that some qualified women, especially those with families, have a harder time relocating than men. Glenn Sugiyama, an executive vice president at DHR International, a firm that helps college administrators find coaches, has seen the phenomenon first-hand in two recent searches for women's basketball jobs. "There were serious women candidates in each case who decided not to pursue it," he says. "The job would have been a step up for them, career-wise, but they didn't want to move. It wasn't about moving jobs; it was about moving, period." That reluctance has to do with the effort it takes some women to have it all. "When women get a job, they 'build a village' to help them support their family while they're coaching," says Celia Slater, who co-founded the Alliance of Women Coaches with Sweet. "It's not as easy for them to leave and move around the country like some men will do." In the end, though, those hurdles are less daunting than two others, more entrenched and insidious, that women have faced over the past four decades: homophobia and blatant sexism. "When you look at the decline in the percentage of women coaches," says Helen Carroll, of the National Center for Lesbian Rights, "sexual orientation has a lot to do with it." Homophobia has haunted women's sports throughout the Title IX era, forcing coaches to stay closeted for fear of losing their jobs, or at least recruits. In some quarters, coaches have been known to signal quietly to prospects or their parents that a competing program is run by a lesbian, in an effort to turn the recruit away. To this day, there is only one out lesbian coach in Division I basketball, Portland State's Sherri Murrell. In a 2009 paper on negative recruiting, Carroll and Pat Griffin, of the Women's Sports Foundation, wrote, "The psychological toll of silence, denial and secrecy results in a climate of fear and hostility that many lesbian, gay and bisexual coaches endure in order to pursue their profession. Others simply choose to leave the profession." It's not only established coaches who check out. Former players often decide the hassle isn't worth it. Two former collegiate stars, Sue Wicks of Rutgers and Abby Conklin of Tennessee, told ESPN The Magazine in 2011 that homophobia still casts a wide shadow over the sidelines. In the same story, former WNBA star Kate Starbird stressed that she wouldn't consider coaching because she refused to be closeted. "I didn't want to live my life that way," she said. At the same time, gay and straight women alike must fight an age-old battle just to level the male-dominated playing field. Merely pointing out Title IX inequities, for instance, can cost a coach her job. The National Women's Law Center conducted a study from 2001-06 that found coaches filed only 8 percent of the 416 Title IX compliance lawsuits during that period, even though they're the ones most apt to see, and best able to document, inequities. Why so few? The NWLC report says that coaches "fear retaliation if they complain." Consider the disturbing case of Fresno State. In the early 1990s, federal investigators slammed the school's athletic department for not complying with Title IX. (On one occasion in 2000, during a department office party, someone hung an "Ugly Women Athletes' Day" poster that featured the heads of school administrators pasted onto the bodies of female athletes.) But the sanctions changed nothing. A decade later, the mistreatment of three female Fresno State athletics employees led to lawsuits that resulted in nearly $20 million in judgments against the school. Volleyball coach Lindy Vivas was fired in 2004, ostensibly for failing to meet performance clauses in her contract. But Vivas sued the school, claiming she was let go in retaliation for a federal complaint she filed alleging inequitable treatment of her athletes, and a grievance she made with the university that pointed out pay discrepancies between male and female coaches. "One strains to imagine what performance clause Vivas could possibly have failed to meet," writes Vermont Law School associate professor Brian Porto, an expert on Title IX. "Her career winning percentage was .612, she was a three-time Western Athletic Conference Coach of the Year, her teams had appeared in a postseason tournament six times, and the academic performance of her players was exemplary." A jury awarded Vivas $5.85 million in 2007, later reduced to $4.52 million. Meanwhile, Fresno State women's basketball coach Stacy Johnson-Klein won a $19 million judgment in 2007 (later scaled back to $9 million) after she proved to a jury that the school looked for a reason to fire her when she threatened to file a Title IX complaint for the inequitable treatment her team received. That case came on the heels of a $3.5 million settlement the school paid to former associate AD Diane Milutinovich, a senior women's administrator for 21 years, who alleged she was reassigned in retaliation for her advocacy of equal treatment for athletes. Those cases may feel like justice, but the three women who stood up for equality did so at the cost of their careers; none are in college athletics today. "There's a feeling that if you take on these fights," Carroll says, "you'll be blackballed." Runge knows that all too well. She never filed a formal complaint during her tenure at Oregon, but she did twice hire a lawyer to negotiate her contract. The first time, in 1994, was after athletic director (and longtime football coach) Rich Brooks declined her request for a multi-year contract. Runge says she was losing recruits to competing programs whose head coaches were locked into longer deals. "We don't do that for women's sports," Runge says Brooks told her. At the time, she was making $32,000 a year, which was $20,000 less than the next-lowest paid Pac-10 coach and $40,000 less than the conference average. "I thought she'd done a terrific job," says Brooks, adding that he hired Runge because he believes women's sports should be coached by women. "I did everything I could to make it right, but only football and men's basketball had multi-year contracts. Whether it's right or wrong, that's what it was at the time." During Runge's eight seasons with the Ducks, she repeatedly went to the administration with equality issues. She believes she developed a reputation for "not playing by the rules" because she was unwilling to allow even small slights to pass. She demanded a share of the "prime" practice slot, 3 to 6 p.m., for her team, and refused to look the other way when the marketing department plastered Mac Court with life-size photos of men's team members, but none of her squad. Runge wasn't blind to the risks she was taking. She routinely sought the advice of other female basketball coaches, two of whom have won an NCAA title. Without exception, they encouraged her to stand down. "They felt I was risking my job," Runge says. "Their comment was always, 'I don't know if I would do that.' Nobody thought I should fight those battles or that I should even ask for anything beyond what I was given." Runge ignored their counsel. She was winning, and attendance at her team's games was at an all-time high. She thought her job was secure. When Runge resigned in the spring of 2001, the sitting AD, Bill Moos, told local newspapers that her players "called a meeting" with him to voice concerns about their coach's acerbic style. Those players, most of whom Runge is still in contact with, say it was Moos who convened the meeting, prying for ammunition. Many of them have since written formal letters of recommendation on behalf of Runge, and the sentiment is unanimous: She deserved better. At the time, none of this shocked Runge, whose relationship with the administration had been frayed for years. She'd had trouble with Moos ever since trying to negotiate her first contract extension with him. The AD had simply wanted to roll over her existing deal, with no increase, even though the Ducks had just won the Pac-10 title. So Runge hired a lawyer -- again. The day after the news broke about the players' meeting with Moos, Runge walked into practice and told her team: "I'm not mad at you. What's happening has nothing to do with you, and it's not your fault." But she was bone-tired. She'd spent eight years trying to change a mentality, and it had gotten her nowhere. "I couldn't fix it," she says now. It was time to walk away. Runge left Oregon believing she still had a future in the game. She didn't yet realize she'd been branded, twice over. Not only had she essentially been fired, but she'd also developed a reputation for, as she puts it, "always wanting something." She was a walking red flag. And now she is a cautionary tale, putting a face on a pervasive fear in women's sports: There are no second chances. Some of the most successful female coaches in basketball, soccer and softball agree that if they get fired, they won't again find a job at a similar level. Frese, who has won a national championship at Maryland, believes one bad experience can upend a career. "You have to be careful and calculating in terms of taking a job that you can go into to be successful," she says. "Because you might not get another opportunity." Becky Burleigh has led the Florida women's soccer team to 11 SEC championships and a national title, helping to develop national team stars Abby Wambach and Heather Mitts along the way. Still, Burleigh harbors no illusions about career security. "I can't imagine getting fired from Florida and then, say, Texas hiring me," she says. "But that could happen in a men's sport. Even if they cheat." She is not overstating the facts. Male coaches -- both on the men's and women's side -- often land on their feet after tanking a program or, worse, bringing the wrath of the NCAA upon it. Brian Agler, current head coach of the WNBA's Seattle Storm, resigned as women's coach at Kansas State in 1996 amid an NCAA investigation that resulted in a two-year probation for the Wildcats and forfeiture of all wins from the 1995-96 season. Since then, he has held three pro head coaching jobs. In 2009, Boston University fired Dennis Wolff, the coach of its men's basketball team. Less than two years later, he had found another job, as head coach of Virginia Tech's women. He had no experience in women's basketball. Eugene's local paper, the Register-Guard, soon released the details of Westhead's deal. It guaranteed him $3.2 million over five years (Smith made $206,000 in her final season), not including a car allowance and bonus incentives for Pac-10 titles and NCAA appearances, neither of which Westhead, who's 46-49 in three seasons at Oregon, has reached. The contract also states that Westhead need only make Eugene his primary residence for seven months a year. "A marked woman is marked forever," Hutchins says. "A marked man is marked until ... you know ... tomorrow. And then he starts over." 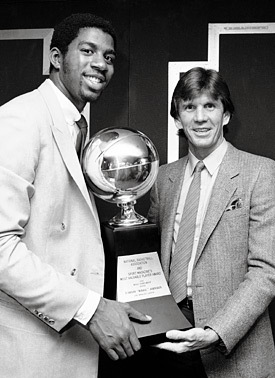 Oregon's Paul Westhead (shown here with Magic Johnson in the early '80s) has had eight coaching jobs at the college and pro levels. But female coaches often struggle to get a second chance. VanDerveer calls her Cardinal program the "recycling bin" because she has made a habit of hiring ousted head coaches. During her tenure, she has brought in Marianne Stanley (USC), Beth Burns (Ohio State) and Trina Patterson (a 17-year head coaching career). VanDerveer says that if she doesn't offer a life raft, no one else will. Female coaches operate under the assumption that their current job will be their only job. That explains why there is relatively little movement within the women's ranks. If a female head coach finds success at a school, she tends to stay put. Although many of these women credit loyalty for their lengthy tenure, they admit that climbing the ladder entails risk. Fall off, and good luck getting back on. There is also a perception that older female coaches, regardless of track record or institutional allegiance, will rarely be allowed to leave on their own terms. While white-haired male peers are often viewed as stately and distinguished as they continue to preside over their benches, female coaches hit 50 and begin looking over their shoulders. In 2011, Debbie Ryan resigned from Virginia after 34 years as women's basketball coach. Multiple sources within the sport confirm that Ryan, who was 58 at the time and had a career record of 739-324 (including 148-84 in her final seven seasons), was forced out. Last year, Old Dominion declined to extend Wendy Larry after she went 20-11. Larry, who is 57, won 559 games in 24 seasons and made 20 NCAA tournament appearances. In other words, beware -- even the sturdiest rung can snap. Jody Runge sits in the front room of A Painted Lady Inn. She's tucked into a corner of the couch, her hands cradling a mug of tea. She blows on the hot drink, lowers the mug, waits. She's telling the story of how she came to buy this place more than 10 years ago. She had been driving around with some girlfriends and her niece, and stopped on a whim. The others took one look inside, shook their heads and went back to wait in the car. Runge saw what they saw -- the rotting wood and ancient appliances -- but she saw something else, too. She knew she could make the old Victorian sing again. It's how she had felt on the recruiting trail, whenever she would find a diamond in the rough, that girl who'd been overlooked by Stanford and Connecticut, who was too raw or too slow or too unskilled. Runge always recruited with one thought in mind: Do I want this girl next to me in a foxhole? If the answer was yes, the coach would bring her to Eugene, and they'd scrap and claw and win -- often in front of a packed arena. "If they didn't want to fight when the chips were down, there was nothing I could say to change that," Runge says. "I always thought that was the only thing I couldn't teach." Runge, now 49, spent the better part of a decade in a foxhole, fighting for her players. "They were the belles of the ball in Eugene," she says. "They felt like they were as much supported as any athlete on campus -- by the community, anyway. They knew some of what we'd accomplished as far as getting equity for them and allowing them to feel that way, but I don't think they knew how hard it was to get there, and to keep it there." After her resignation, Runge left Eugene because it was too painful to stay. Trips to the grocery store turned into conversations with fans about how shamefully she had been treated. How unfair the whole thing was. How much the Ducks missed her. "It was like ripping off a scab," she says. "Daily." Runge takes a sip of tea and raises her eyes to the ceiling. She'll be at yoga in less than an hour, wrapping herself into an impossible pose, meditating on something other than her exile from the game she loves. But right now, she's thinking about the second chance she still hopes for. The one that likely won't come.